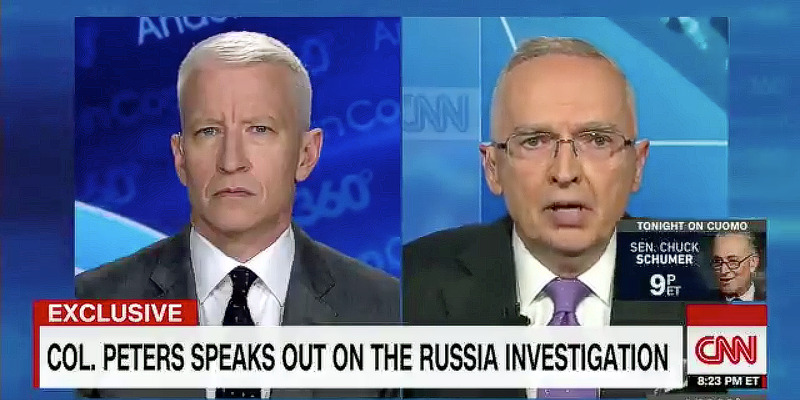 Screenshot via CNNThe retired US Army Lt. Col. Ralph Peters appearing on CNN with Anderson Cooper. President Donald Trump is the “perfect target” for Russian intelligence. That’s what the retired US Army Lt. Col. Ralph Peters asserted during a CNN interview on Wednesday night. “That’s made-to-order for seduction by Russian intelligence,” Peters said. 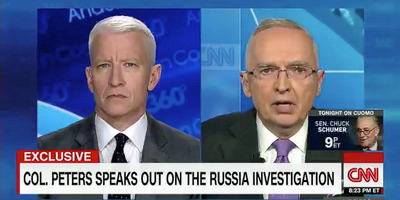 Ralph Peters suggested during a CNN interview that Russian President Vladimir Putin had “some kind of grip on Trump,” pointing to the US president’s documented affinity toward Putin and his hesitation to speak critically of the Kremlin. Peters, who trained in Russian studies and the Russian language and who has experience with Russian intelligence officers, said Trump’s public behaviour showed signs of someone who may be compromised by one of the US’s most formidable enemies. “That’s made-to-order for seduction by Russian intelligence,” Peters said, later adding that he hoped such conjecture turned out to be false. Publicly, Trump has often shied away from criticising Putin – instead praising him and his leadership before and after the 2016 election while lamenting that such praise is frowned upon in the US. He has also slow-walked sanctions on Russia that other US officials have sought.